Paan, commonly known as betel leaf is an evergreen and perennial creeper, with glossy heart-shaped leaves. The betel plant originated from India and South East Asia. The leaf is mostly consumed in Asia, and elsewhere in the world by some Asian immigrants as paan. Amongst the South Asian communities in East Africa and Madagascar, the vine can be found in some homes all along the staircase, and at the foot of staircases. In more luxurious homes, a paan vine would surely be creeping along the first available wall. It might not be as exotic as the jasmine and the chambeli, but it is a vital inhabitant for an Indian home. In 1955 when I was young and curious to find out what happened around me, I was ready to enter the world of the adult. Paan eating and speaking in secret languages was one of those secret avenues. Paan eating in the 1950’s was the domain of the adult. So when the older siblings were ready to go off into town to have a paan, they would say “CHE pa CHE ne,” so that us, the young ones, could not decipher the word as it was broken up by CHE. This language was called CHE ni Boli, the secret language of CHE. How fascinating! And it was spoken so fast that it took a very long time to break the code. But once you had broken the code, voila, you had crossed the boundary and you were in the august realms of the adult! Now it was our opportunity to dominate. We were in the sacred space of an unknown language and at every opportunity we would flout this power of the word that had put us into the heights of the supreme. What a world of power we had entered. The tight doors of entry had been broken. So What Was It About Paan? In the days of yore, paan was a delicacy for the rich. At the dinner events in the Raaj, after dinner, paan was passed around. Now this was no ordinary paan. In the leaf were ensconced many a treasures. One was a red paste for the sweet paan and a white paste for the paan with a tang given by lime paste. Then there was sesame seeds, fennel seeds, roasted to perfection, grated coconut and often a split cardamom. Young people had a baby paan with nothing in it but some sweet paste and coconut, and occasionally some sesame seeds, called tal. Of course there were other more potent paans, which can have tobacco and other so called uplifting but damaging items. The adults had a paan with a tang, the white paste was a chuno that gave it a tang. Not only that but the paan had sopari, a nut of a palm tree. Also called a beetle nut, the sopariis a very hard nut that requires a very special cutter called suri. There are many varieties of suris. Exotic gold ones with a jangle, silver ones in all shapes and sizes and bronze ones too. Soon the paan traveled from the courts of Raja to plebs and peasants. So the well to do middle class family would have a paandani, a silver salver that held paan. 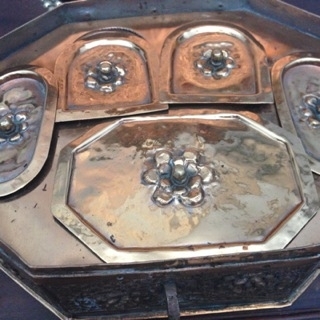 Inside the paandani were silver holders, one with paste, sopari, simsim, saunf,and daal, with aromatic leaves and coconut. Needless to say the up keep of the paandani was up to the woman. She ensured that the silver was polished, the sopari was cut, and the sim sim roasted. The head of the family had the privilege of making the paan. It was only made after dinner, it was not chewed at lunch! The first paan would go to the head of the family and then would come the sons and mother and daughters in law and then the children with their baby paans. What a ritual it was! Paan shops mushroomed along side eating houses. In Kisumu where I was born, I recollect a paan shop called “Rambharos Paanghar,” meaning a paan shop trusting in God. There were many other items on sale at a paan shop, soft drinks advertised as ‘soda’ ice creams, chocolates and sweets. The die-hard paan eaters would stop at the paan shop for a chat and local gossip. My favourite memory is of riding in the car of an avid paan eater. He would come to a traffic light stop on Salim Road. This is the main road in Mombasa. As he stopped, the paanwalla, would come out and hand him a packet. This was an evening ritual. The paan packet contained enough paan to last till the next evening. In Mombasa, paan shops were usually neighbours of places where we could purchase coconut water and crisps. Usually an open barbecue area had a paan shop close by. It was customary to eat paan after a meal. A popular place for paan today is the Diamond Plaza which has Indian shops and restaurants as well as at least five paan shops. Hashmi’s, a very popular chicken tikka place, also has a ‘Paan Corner’. This particular one is set up with a little fountain where paan leaves float and everything is clean and cheerful. The journey of the paan chewing fascinates me. The once exotic ritual practiced in the palaces of the maharajas went domestic. Then from domestic ritual to the commercial. Paan shops and stands are everywhere, in India, of course, but follow the Indian diaspora all over the world. Whereas at one time the paanwalla was an Indian, with the art of making paan going from father to son, today we find many local people making paan too. My children eat paan, will our grand children? I wonder. Date posted: Friday, January 30, 2015. Last updated: Tuesday, February 3, 2015.